OXO Good Grips Stainless Steel Food Scale Just $28! Down From $50! PLUS FREE Shipping! 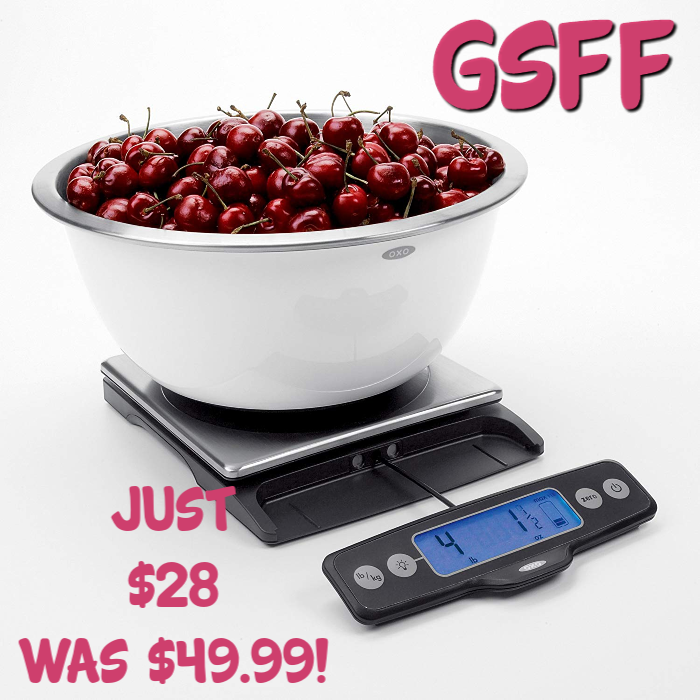 You are here: Home / Great Deals / OXO Good Grips Stainless Steel Food Scale Just $28! Down From $50! PLUS FREE Shipping! Don’t miss this deal from Amazon! Get this OXO Good Grips Stainless Steel Food Scale With Pull-Out Display for just $27.74, down from $49.99! PLUS FREE shipping! This innovative scale ensures accurate measurements every time. It has a digital display that pulls away from the base to prevent shadowing from large plates or bowls and has a large, easy to read numbers and an optional backlight for zero visibility. Precisely weigh ingredients for baking or cooking, ground coffee for pour-over, and food for portion control! The sleek stainless steel platform is removable for hand washing, and the slim, cord-free silhouette makes for compact storage. Innovative display pulls away from base to prevent shadowing from large plates or bowls, thin profile allows for easy storage. Removable stainless steel platform can be hand washed.